Come in and take a look at the new posters being displayed at Todd Library. They are reproductions from the Federal Art Project (FAP) made during the Depression for the Works Progress Administration. 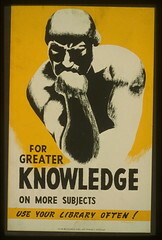 The goal of the project was to hire unemployed artists to create art for governmental buildings, such as libraries. The Project helped create over 200,000 murals, posters, and paintings. For more information about the project, see the American Memories section on the Library of Congress web site.